When I was in 7th grade Home Economics we had to share what we wanted to be when we grew up, and then do a special project around it. I wanted to be the next Ann Landers. I wrote her a letter and she wrote me back! I will never forget her perfect penmanship and her basically telling me I can be whomever I want to be. I may have strayed into Marketing Communications for a while...but looks like I landed in my vision. I have been practicing Marriage & Family Therapy since 2002. To date I have over 10,000 client contact hours as well as over 2000 hours of practice and education in the therapeutic realm. I have a Master's degree in Marriage & Family Therapy, and am a dissertation away from a PhD in Holistic Psychology. I feel fortunate to have been placed on an integrative path of traditional and holistic psychology. Through my education and experience, I have incorporated these methods to create a powerful, practical, and realistic therapeutic approach - one that is designed to support clients with THRIVING. Following Dr. Barry Green's philosophy of "Healer, Heal Thyself," I am continuously processing and investing in my own growth. I hold myself accountable to be congruent in what I teach. 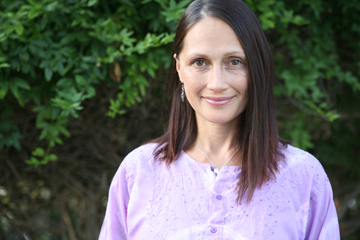 I've studied at Body Mind College, completing a Holistic Health Practitioner (HHP) Program. There I learned various body-mind modalities that focus specifically on balancing the body and releasing mental, emotional, and physical stress. I take pride in having served as an apprentice to Dr. Green, whom is an author, cofounder of five holistic schools, and has over 50 years of personal and professional background as an educator and practitioner in the body-mind realm. Under his guide, I have become one of only a handful of healer to earn a Holistic Certification, where I was trained to support others with deep, core level processing. I believe you have everything you need inside of you to work through any issue. It starts with Commitment and it doesn't matter what motivates that. Then Clarity - taking the time to truly understand what your thoughts, needs, and challenges. Followed by Clearing - releasing dysfunctional thoughts, feelings, and beliefs in a compassionate and assertive way. And completing with Integration of more productive and positive thoughts and actions. All the therapy I do has and emphasis in Emotional Intelligence (EQ), which increases self-awareness, self-care, and a higher consciousness in all that you do, especially in relation to those whom you respect, care, and love. My style is interactive, experiential, and present-oriented - with the essential goal to live life in the most real, logical, and fulfilling way possible. To THRIVE. I am known to be a bit of a vigilante in growth and healing. ...and believe in the power of Accountability - being really present and respectful of your inner process, and your self as a whole. I view the therapist/client relationship as a partnership, and we will work together to really get clear and create a plan that works for you (and/or your relationship). My methods are experiential and practical, done with compassion and assertion. There will be consistent Practice and Repetition, to embody your experience. Having a special interest in the joining of traditional and holistic therapies, I incorporate body and mind modalities withe behavioral, cognitive, and emotionally-oriented modalities. I have the philosophy that all we do is motivated by LOVE. I specialize in couples and families, and am well on my way to becoming certified in Emotionally Focused Therapy (EFT), which is known as the most effective relationship theory in the world, and have personally trained with founder, Susan Johnson. I also believe in the power of intensive counseling and offer a VIP HEALING PROGRAM™, which is designed to support you with deep healing in the most efficient, effective, and empowering way possible. As I am evolving, I am finding and combining passions. I have noticed that my most powerful sense of purpose - and most profound projects - have been born from my experiences as a mother. So, special thanks to my family: Jason, Olivia, and Maya. (You will clearly see that all of my passions are centered around increasing Emotional Intelligence (EQ) aka my most favorite wellness-related thing in the world:). We are in the process of obtaining 501(c)(3) status. This charity will be dedicated to supporting individuals and families worldwide with uplifting themselves and others through self, social, and emotional wellness. All monies raised will be used to fund projects and programs throughout the world with the hopes of a global shift in Emotional Intelligence (EQ). Read more! Everywhere. Every single one. Every day. Read more! EQ it UP! is a dream that I began exploring in my graduate studies. I recall doing a research project to create emotional wellness in schools. My professor loved the idea but had doubt it could be implemented. Well...there's only one way to find out. Now we are offering the EQ it UP! Uplifting After School Workshop!